BAKER COUNTY, Fla. - A couple dozen candles were lit Saturday evening in honor of Lonzie Barton. Baker County residents held a vigil to remember the child, who they said has touched so many hearts over the last six months. The vigil lasted about an hour. Baker County residents brought balloons, cake and a large board with Lonzie's name on it for people to sign. It was all done to bring closure to those who knew Lonzie, and even those who didn't but were still moved by the story. "I have three babies so it really hits home. Especially to a parent," said Gloria Patterson, who attended the vigil. Patterson's reasons for attending may explain the turnout. 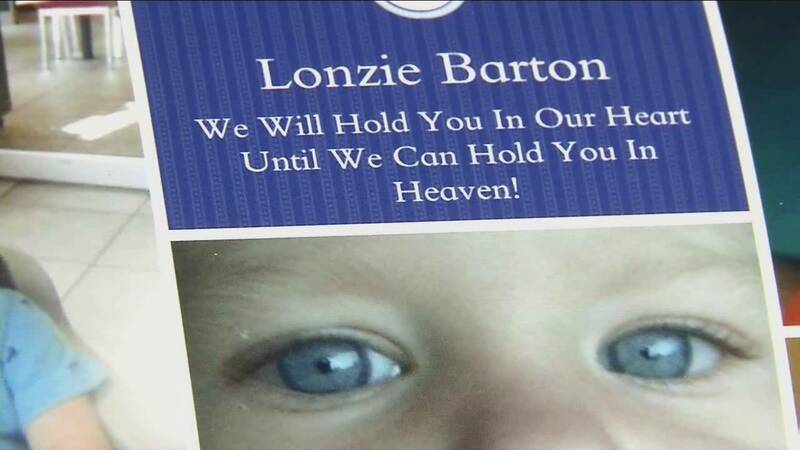 Dozens of people showed up to remember Lonzie, the blue-eyed boy from Baker County. Music filled the air and parents held their children close as they were reminded why it's so important. "You become very close to them," said Patterson. "You would want someone to do the same for your child." Although everyone wants to see justice for the toddler, Saturday night was reserved for remembrance, and the lights left on for Lonzie can now be blown out. "What matters is Lonzie," said Peg Moore, who also attended the vigil. "We need to, like the pastor said, let him be our shining light now and go out and do things in his name." Baker County Sheriff Joey Dobson was also at the memorial. He said the family is working on funeral arrangements. The funeral will be held in Baker County, but the date hasn't yet been made.